Illuminations is a terrific, all-in-one curriculum choice for homeschooling families. The program we tried out is based on Mystery of History (MOH) Year 2, which is a wonderful spine for your history study. Illuminations builds on MOH by adding content, lesson plans, and guidance for (almost) all of the other subjects, including science, Bible, and language arts. So what exactly do you get? You get all the lesson plans and schedules for each week for an entire year. You also get literature study guides, copywork selections, and a Bible reading plan for the year. One of the nicest components is the weekly schedules. 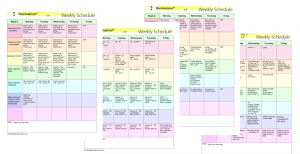 They are presented as editable PDF files, so that you can customize each week to fit your school and schedule. The basic books you need in order to get the most out of Illuminations Year 2 are Mystery of History, Natural Speller, English From the Roots Up, The Ultimate Geography and Timeline Guide, Christian Kids Explore Earth and Space, and a Bible. There are several options for Grammar; you’ll need the books that go along with the program you choose. All the planning for each subject is done for you, which makes this program a terrific help. Add Math and you’ve got a complete program! I particularly like the literature guides that are included in Illuminations. The literature selections are wonderful, and the guides make study and discussion super easy. For year 2, there are 13 family study guides and 16 read alone guides. The family study guides all include day-by-day discussion questions that correspond to that day’s reading, activity suggestions, and many also include worksheets that complement the reading. Two versions are offered – one for the student and one for the teacher (with answers!). Often, moms don’t have time to read every literature selections they assign. Having the answers to the discussion questions takes the pressure off mom. We enjoyed the geography activities and the list of supplemental DVDs or videos for each week. We also found that the amount of work scheduled for each week is a just-right amount – not too much and not too little. My students were able to keep up without being overwhelmed. We were also able to supplement some extra readings on our own from books that we have enjoyed in the past. Of course, with the editable schedules, increasing or reducing the amount of work in each week is a breeze (except, of course, when you have to decide which nifty activities you really don’t have time for!). The only issues I had with this program involved the included hyperlinks and the copywork component. Several of the hyperlinks we tried were broken. That seems to be par for the course with any program that includes live links to information housed on external sites. I would like to note that none of the broken links were absolutely necessary to our study of the topic. Also, I am not sure how to get around this issue in this type of program – links come and go at the speed of light. As for the copywork, I was happy with the selections. 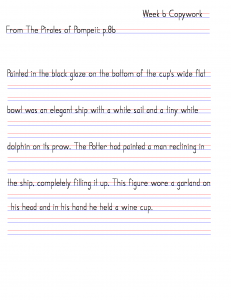 I would have preferred to have access to the selections in text, though, so that I could copy and paste into a handwriting worksheet generator I own. Instead, I had to type each selection into my generator. I know this shouldn’t be an issue for older students who can work without a model or complete the assignments as a dictation exercise, but it was for my 3rd grader – he isn’t ready to copy everything on his own without a model. I recommend Illuminations Year 2 for its completeness and ease of use. If you want to learn more about it, please visit the Bright Ideas Press site where you will find samples, a brochure, and introductory videos. Illuminations can be purchased directly from Bright Ideas Press: $82.50 for a single semester; $165 for the entire year.